Before I go on, let me tell you how impressed I am with The Mason’s Arms at Gargrave. I’ll knock together something for Tripadvisor tomorrow which I’ll copy here. Anyway, here’s how I got here…. Smart move to be in Wales when England are playing in the World Cup with a 23:00 kick off on a Saturday night. I had a really peaceful night’s sleep, and despite my worse fears to the contrary, no early morning returning guests or other carousing disturbances. Thank you Wales. I’m starting today’s tale whilst seated on a moderately comfortable display fixture in Old Navy on 34th Street. Kay is in her element and I doubt she’ll be sated for a while. And it’s snowing outside. An un-hurried, and if I’m being truthful, very slightly hungover morning saw us out on Times Square at 09:30. 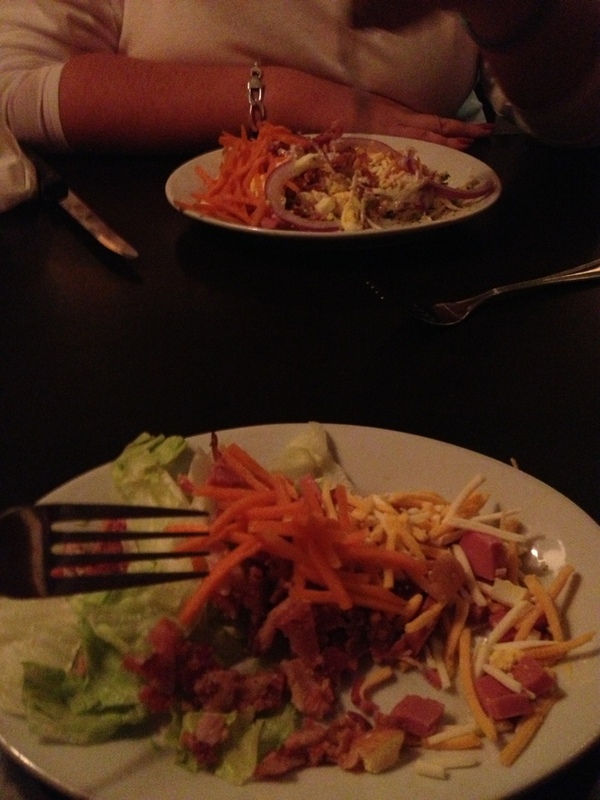 Last night in the Heartland Brewery had been really enjoyable; great steak (not to mention the Caesar salad!) and even better beer – if really expensive. I’d had pints (US pints which are slightly smaller than the Imperial variety) of their stout and their porter – both really tasty and in the region of 6.5% strengthwise. Each had a price tag of, as I recall, $4.68 plus tax. Kay had started off with a raspberry cider (ordinary cider with flavoured liqueur) which she really enjoyed, follow by the Heartland sampler rack of six 5oz beers. Truth be told, I suspect that was ordered more with me in mind, and I ended up finishing most of them after Kay had had a good sample. With tax and obligatory tip, we came away about £75 lighter, but I’d count it as a good night. This morning the original plan had been to get a hop-on-hop-off tour bus ticket, but frankly, the TripAdvisor reviews, among other factors put me off. Chief among the ‘other factors’ being the fact it is the annual NYC St Patrick’s Day parade today, north along Fifth Avenue from 44th Street. This would undoubtedly cause traffic chaos and I reasoned it would be bound to cause the tour to be curtailed somewhat. Turns out the parade was going to have an effect on our day, but in many ways, that was all part of the plan. Still a bit ‘tight’ from yesterday’s walking, we set a more modest goal of aiming for the area of the parade start and taking it from there. We duly set off and were quickly in step with a modest trickle of emerald-green clad revellers, which later became a mass. We sought respite in a Starbucks on 46th Street and watched events in the street outside. A marching band from Staten Island primped and preened their uniforms in readiness for their spot in the parade, and ever more (most teenaged) attendees trooped past. The SBs was fairly quiet when we went in, allowing us to bag a window seat. It quickly got busy, with patrons including an NYPD beat cop taking his break, and a Long Beach (not sure which Long Beach) firefighter in his dress uniform prepared for the parade with a coffee with his family. By the time we set off, via the adjacent NHL Store, even Sixth Ave was manic. All the cross streets toward Fifth Ave were blocked off and cops were limiting those who could even walk up to Fifth. Then a bolt of inspiration struck: All things considered, there was a good chance the parade would limit those wanting to go up to the “Top of the Rock” (the 68th floor observation deck of the Rockefeller Center). Turns out I was spot on, and having coughed up our $25 each, we were pretty much straight up. Even better, the cloud was high enough for occasional weak sun and a cracking view. Within half an hour up there, however, the cloud dropped and the snow started. It was quite remarkable that there was little wind, and while I wouldn’t say it was warm up there, it was completely bearable. Though not as high as the Empire State Building, there are thee floors and quite a lot of open air space to view from. 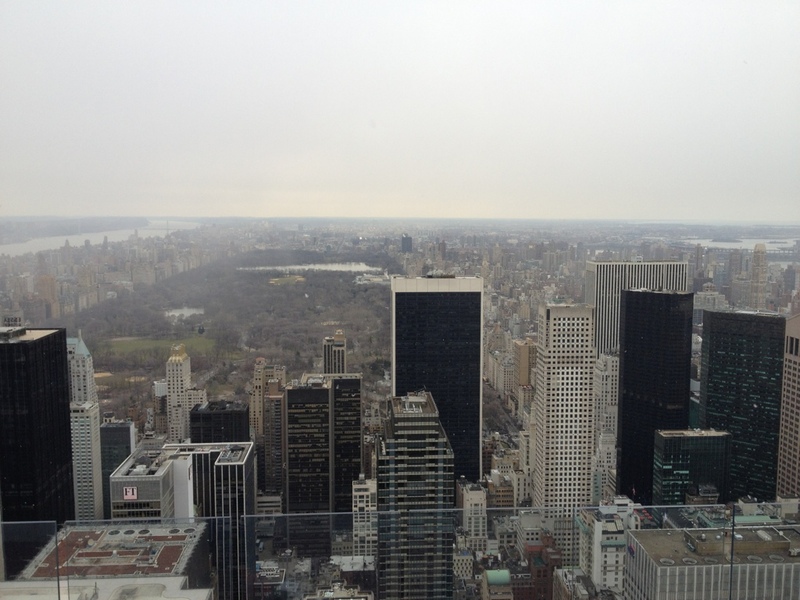 Plus, being that further north, the views of midtown and Central Park are much better. All-in-all a good decision and really enjoyable. We had the odd glimpse of the parade from up there, and could even hear the marching bands at some times. When we descended, after a brief pause in a sandwich shop to buy lunch, we were hit by Irishness in full force. A tide of green was pushing, shoving, shouting, singing, and cavorting – in no particular direction, and a full block from the parade. We found an oasis of calm in the form of a bank frontage with security guard keeping order, and a.lowing tourists respite to sit and eat their lunch on the wall of the ornamental reflecting pond. We watched the chaos from the other side of the street before pressing on once more. We ventured into no man’s land between Sixth & Fifth Ave, being allowed through. Y a coupon the grounds we were visiting City Sports (best value T shirts in NYC or Boston). While we were in there one of the shop assistants exclaimed “oh my god there’s a fight right outside the store!” The assistant who served us was most concerned and even offered to let us out the back door! Turns out the “fight” was handbags-at-twenty-paces, almost literally as the antagonists were three girls. At the end of the street we joined the periphery of the throng long enough to watch a few bands march past (this was two hours after it set off and still around the point it started – such is the volume (in both senses) of those who take part. By now Kay was in need of a restroom, which, it seemed, were several hundred parade watchers. We found the toilets in the Rockefeller Center and Kay joined the queue, which was dutifully marshalled by a female security guard. The queue snaked past an entrance, so the guard enforced a gap so as not to block it. Two unsuspecting and evidently naieve ladies failed to notice the queue and promptly entered the toilet – to howls, snarls and shrieks from the ladies behind them! I think Kay was one of the loudest! They quickly realised their error and sheepishly went to the back. That mission of mercy dealt with, we scoured the NBC Studio Store for bargains, but completely failed to find any. We’d had enou of the madness surrounding the parade by then, so fought our way down to the subway and took the D Train two stops south to 34th Street. The snow was much heavier now, but as the forecasters had predicted this morning, showed no sign of settling. Nevertheless, the hundred yards or so we walked along 34th Street was into the teeth of a blizzard, and Old Navy formed a welcome respite from the weather. Right, I’ve typed all that and still no sign of Kay. Best go and see what the damage is! I found Kay totally absorbed in her quest. Unfortunately, Old Navy failed to attract her custom, but it really wasn’t for the want to trying. I, on the other hand, did see fit to invest in a new pair of jeans and a T shirt – I know how to push the boat out! We ventured further along 34th Street, and found Lenny’s – yet another chain of deli/fast food eateries, who sorted us out with coffee and root beer respectively (though Kay’s request for root beer blew the guy’s mind as he thought she was asking for rude beer!). As we exited Lenny’s – across the road from the now deserted Border’s at Madison Square Garden – one of the parade attendees was brazenly relieving himself in plain view on the corner of the shop. There’d been two cops having a coffee in their a few minutes earlier, but unfortunately they’d gone on their way. It’s a wonder the shop owners didn;t come out with a baseball bat – it was that blatant! Next stop K-Mart, and more shop-fixture sitting. It’s all in a good cause as, after all, this was part of why we came here. Back out of the street and the snow was still coming down hard – but still no sign of it settling. As we walked north on Seventh Avenue, back toward Time Square, the parade attendees were streaming south. Many were drunk and, frankly, obnoxious. One member of a group of youths walking towards us quite deliberately shoulder-barged a small Asian man walking in front of us with his wife. Of course, the “guys” all thought it hilarious, and the man simply looked round at them, totally bewildered. The behaviour we witnessed (and it’s still only 17:00) makes me feel sorry for the Irish in general and New York Irish in particular. These arseholes aren’t Irish, they’re arrogant drunk Americans who have a pack mentality – but give the Irish a bad name. We’re back in the room for a refresh and to let some of the madness outside subside – hopefully – but it’s Saturday night in midtown Manhattan, so I’m not optimistic of too much sanity!